Tigers are large, strong, and dangerous cats. They have the ability to take down a 500-pound antelope, are strong swimmers, and are very territorial. Male tigers will cover a territory up to almost 40 miles and females cover about 7 miles. Males mark their territories by spraying urine and feces and do not do well with other males. Although tiger cubs are small and cute, they will quickly grow up to be hundreds of pounds with several inch long canine teeth and claws that you'd rather not get scratched by. You cannot declaw a tiger like you would a house cat (since they use their claws to walk on) and removing their large teeth is not only inhumane, but it prevents them from tearing apart their food. Once a tiger cub gets big enough to push you over, it's probably a bad idea to be wrestling with them. Even their "play" bites can cause serious damage to or kill a person. Many tigers are trained to be around people and will go years without incident but you can't predict the behavior of a tiger. They are still wild animals at heart. Famous trainers have been mauled by their beloved tigers, even after working with them daily and for years. They are unpredictable and it is a huge risk to be handling a mature tiger whether you are a professional or not. Tigers need a lot of secure space. They can jump, climb, and swim their way out of most enclosures. In the wild, they roam on several miles of land, something most people don't have access to. A large plot (several acres) of fenced-in property with access to ponds or small lakes, trees, and shelters is what a tiger needs to be safe from the world (and to keep us safe from them). Tigers have been known to escape from zoos and private properties and have killed people since in captivity they associate humans with food. An escaped tiger is scared and dangerous, something no one wants roaming the streets. One reason you need such a large enclosure is to provide enrichment opportunities. Tigers need to use their brains to catch things, play with things, jump, climb, and explore. A bored tiger is an unhealthy tiger. Zoos often use large plastic balls that tigers will jump on in pools, and offer hanging containers with food inside or areas to climb in and on. Tigers can and do get depressed and bored without enrichment. You probably can imagine how much food a cat the size of a tiger will eat. Of course, the amount will vary with the species of tiger, but regardless, even a 300-pound tiger will eat much more than you and your house cat combined. Tigers eat meat and a lot of it. Antelope, gazelle, water buffalo, deer, fish, and really anything else they can get their opportunistic paws on makes up a tiger's diet. This obviously gets expensive considering they will eat about 10 to 15 pounds of meat, or 5,000 to 6,000 kcal, a day for over 20 years. That's a lot of meat and money, not to mention the vitamins and supplements that are needed to add to the animal's diet. Also, a commercially prepared meat mix (usually containing primarily horse meat) and bones should be offered to aid in nutrition and natural chewing, but studies have shown these commercial diets alone are not really what a tiger in captivity needs. They are usually deficient in taurine and have too much vitamin A, and the requirements of individual tigers vary depending on the season, activity, species, and other factors. You can see how it can be difficult to properly manage a tiger's diet in captivity. Tigers suffer from many of the same illnesses that affect house cats, such as distemper and rabies. 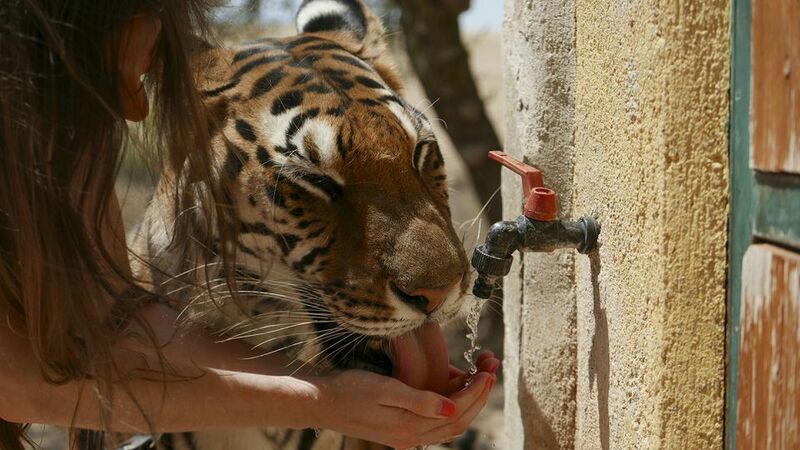 It's important to immunize a tiger against these common (and preventable) conditions. Feline immunodeficiency virus (FIV) is a feline equivalent to human immunodeficiency virus (HIV). Unlike its human counterpart, however, FIV is totally curable with treatment. If not treated, FIV can weaken the animal's immune system and make it vulnerable to other contagious diseases. Tigers also are susceptible to the much more serious feline leukemia virus (FeLV). This virus produces a number of other illnesses in cats, including anemia, chronic infections, and other cancers. FeLV can be treated, but if it develops into full-blown cancer it is almost always fatal. Is It Legal to Own a Pet Tiger? Most states have restrictions on owning exotic pets like large cats, especially in heavily populated areas. You should check the rules in your area before purchasing a tiger. Many a well-meaning owner has become overwhelmed by the demands of caring for a tiger, and the prospect of one escaping is serious indeed. If you have a pet tiger or are seriously considering getting one, please remember the huge commitment of space, time, and money that they require. If you are unable to properly care for your pet tiger finding a new home for them can be extremely difficult. According to Big Cat Rescue, a tiger cub is at the top of the price range for exotic cats, at around $7,500. The organization advises that it's difficult to find a veterinarian in most areas able or willing to care for a tiger, and that the overwhelming majority (98 percent) of big cats die within two years of being taken into captivity. Big Cat Rescue also advises that owners should expect to spend up to $20,000 for a cage sufficient to house a full-grown tiger. Check out our other profiles of pet cats if you're still not sure which one is right for you.